All laundry detergent has been with families for generations, thanks to its winning price and effective ingredients. Since 1959, All has been working hard to keep your laundry fresh and clean. All laundry detergent is owned and manufactured by Unilever, a company that was founded in the 1890s. Unilever started with the product Sunlight Soap, which helped promote proper hygiene during England's Victorian era. With the pitch idea of making less work for women while still getting things cleaner than ever before, the idea caught on and continues to be a staple focus today as the company continually produces new products that are effective, efficient and environmentally friendly. All itself began in 1959, and has been a household hit right from the start. Self-described as the "true stainlifter®", All is now available in an impressive amount of varieties, from the standard original to allergy-aware formulations. Quite possibly a saving grace to many families with pets and/or young children, All Free Clear is made free of dyes, perfumes and preservatives. It is perfect for those with the most sensitive of skin, and has been known to help remove common household allergens such as pet hair and perfumes. For babies and young children who naturally have sensitive skin, Free Clear will not irritate the skin and also saves money with each load - All comes in cheaper than Dreft® and other popular baby detergents. As its name suggests, small & mighty gets laundry clean with just one tiny capful. The lesser amount of packaging is as good for the environment as it is for your clothes, and comes in a variety of fragrances. Choose from the 32 or 96 load size, and enjoy more space in your laundry room and nature-friendly cleanliness the whole family will appreciate. When you need a serious stain lifter, All's 2x Ultra is able to get out the grime other detergents can't. Available in fun scents such as Dancing in the Tropics and Wandering through the Wildflowers, you can also buy it in specialized stainlifter™ formula that goes above and beyond its already built in fighting power, as well as a baby formulation for your tiniest family members. Available in load sizes 32 through 110. Finally, for the high efficiency washing machine, All has a line of products just for you. Conserve energy and get your laundry done in one fell swoop thanks to the small & mighty work of HE detergents available through this great brand. To keep up with current promotions and receive valuable coupons, you can register at All's official website and have special offers emailed directly to your inbox. This is convenient for an impromptu shopping trip, which can happen more often than not when it comes to families with pets and young children running around. You must be at least 13 years old and a U.S. resident to join, but as long as you meet those requirements, detergent discounts are just around the corner. When using All laundry detergent, or any other cleaning agent, be sure to follow the instructions fully. 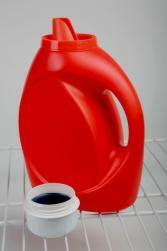 Using too much detergent can damage your clothes, while using too little can be ineffective. Be sure to keep your detergent bottles capped tightly and out of reach of small children. Like most household products, All is dangerous when ingested, so proper safety precautions should always be taken. Not sure where All Is available? Chances are your local grocery store carries it, as do home stores such as Target and Walmart. If you still aren't sure where to find it, or if you need to special order some, you can call 1-800-298-2408. In the instance of a medical or safety emergency, call 1-800-745-9279, which is available 24 hours a day, seven days a week for all consumers.